This post is a discussion about making bug tracking in Bugzilla for the Mozilla project more efficient. However, I believe it is applicable to any open source project or even companies or governments running service desks (think 311). Almost exactly a year ago I wrote a blog post titled: Some thoughts on improving Bugzilla in which I made several suggestions for improving the work flow in bugzilla. Happily a number of those ideas have been implemented. One however, remains outstanding and, I believe, creates an unnecessary amount of triage work as well as a terrible experience for end users. My understanding is that while the bug could not be resolved last year for a few reasons, there is growing interest (exemplified originally in the comment field of my original post) to tackle it once again. This is my attempt at a rallying cry to get that process moving. Those who are already keen on this idea and don’t want to read anything more below, this refers to bug 444302. I first had this idea last summer while talking to the triage team at the Mozilla Summit. These are the guys who look at the firehose of bugs being submitted to Mozilla every day. They have a finite amount of time, so anything we can do to automate their work is going to help them, and the project, out significantly. 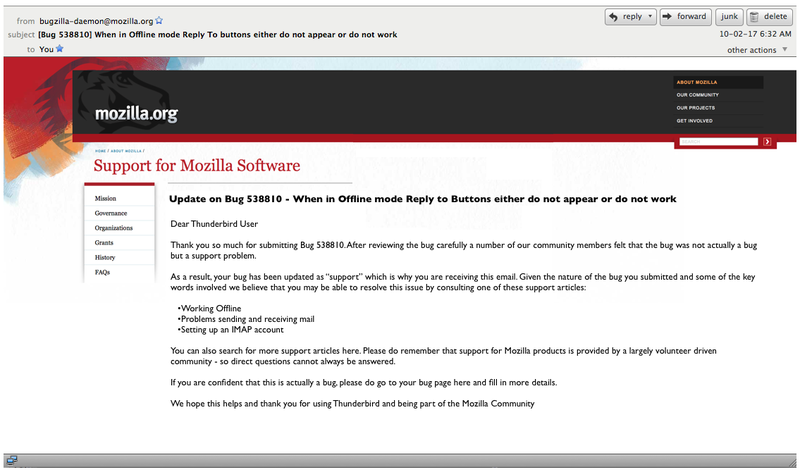 Presently, I’m told that Mozilla gets a huge number of bugs submitted that are not actually bugs, but support issues. This creates several challenges. First, it means that support related issues, as opposed to real problems with the software, are clogging up the bug tracking system. This increases the amount of noise in the system – making it harder for everyone to find the information they need. Second, it means the triage teams has to spend time filtering bugs that are actually support issues. Not a good use of their time. Third, it means that users who have real support issues but submit them accidentally though Bugzilla, get a terrible experience. Step 1: My sense is that this issue – especially problem #3 – could be resolved by simply creating a new resolution field. I’ve opted to call it “Support” but am happy to name it something else. This feels like a simple fix and it would quickly move a lot of bugs that are cluttering up bugzilla… out. Second, there is an opportunity to explain to them where they should go for help – I haven’t done that explicitly enough in this email – but you get the idea. Because, because we’ve done a query of the Mozilla support database (SUMO) we are able to include some support articles that might resolve their issue. The best way to implement this would be a field on SUMO where you paste a bug number, and it reaches out, downloads the Bugzilla information using the Bugzilla API, and creates a new SUMO entry using it. It then goes back and uses the API to automatically resolve the Bugzilla bug – either as SUPPORT, if we have that new resolution, or INVALID, or MOVED (which is a resolution Bugzilla has had in the past for bugs moved elsewhere), or something else. The SUMO end could then send them a custom email, and it could include hyperlinks to appropriate articles if the SUMO engine thought there were any. Gerv, I love you point 3. Exactly what I had in mind, have SUMO pull the relevant data from the bug report (we just need BMO to autodetect firefox version numbers, bug 577561 ;) and then it should have most of the required data. That would save the user so much time and remove a major time barrier. They think “I just filed a bug, now they want me to start a forum thread?” If it does it automatically, the user would be so much better served. So, if there is interest in doing this, let me know. I’m happy to support any discussion, should it take place on the comment stream of the bug, the comments below, or somewhere else that might be helpful (maybe I should dial in on this call?). Regardless, this feels like a quick win, one that would better serve Mozilla users, teach them to go to the right place for support (over time) and improve the Bugzilla workflow. It might be worth implementing even for a bit, and we can assess any positive or negative feedback after 6 months. Bug 444302: Provide a means to migrate support issues that are misfiled as bugs over to the support.mozilla.com forums. This entry was posted in mozilla, open source, technology and tagged bugzilla, community management, mozilla, opensource on July 27, 2011 by David Eaves. Yay. My pet bug is getting blogged. I talked to some of the SUMO devs a month or two ago, and the easiest way they suggested to do this might be from Bugzilla’s side – generate a link to SUMO in the “resolved support” closure email that preloads the fields from the bug report and sends them into the ask a question process. Thanks Roland, not sure what happened there. Should be fixed now. Please post accurate data if you want to get credibility. Your screenshot of your bugmail is a fake one. “INVALID” was “RESOLVED” originally. “INVALID” is not a bug status. So your user asking for support never got this email as is. I’m confused; what am I missing?. https://bugzilla.mozilla.org/page.cgi?id=fields.html#status lists “INVALID” as an, erm, valid bug status. … as a bug resolution, not a bug status. OK, I can see that now that you explicitly point it out. As a Bugzilla newbie myself (I have only used it once or twice ever) I don’t really know the difference, and the UI doesn’t help me understand it, either. The help chart is also laid out poorly and this fact wasn’t intuitive to me. David, just so you know, the guided bug submission form now auto detects Firefox and SM versions automatically. Good to know Tyler – when I looked at the bug, it was labelled as “New” so I thought it hadn’t been patched. Should its state be changed? Once we get the approval to add the SUPPORT resolution, adding a link to the outgoing text email to the SUMO site would be trivial. In the templates themselves its just a matter of looking for ((status = ‘RESOLVED’ OR status = ‘VERIFIED’) AND resolution = ‘SUPPORT). Filling in bug information inside the generated link will take some extra thought but not impossible. A lot of the bug data is already available in the template that is used to generate the email. Just look at the mail headers to see what I mean. The only thing (and probably critical) is the original bug description. Maybe just the closing comment is all that is needed.